The screencast below demonstrates how to install, configure and use PyQSO (focussing on version 1.0.0 only). Detailed instructions are also available in the sections that follow. It is recommended that users run PyQSO on the Linux operating system, since all development and testing of PyQSO takes place there. As the name suggests, PyQSO is written primarily in the Python programming language (version 3.x). The graphical user interface has been developed using the GTK+ library through the PyGObject bindings. PyQSO also uses an SQLite embedded database to manage all the contacts an amateur radio operator makes. Users must therefore make sure that the Python interpreter is installed and that any additional software dependencies are satisfied before PyQSO can be run successfully. The list of software packages that PyQSO depends on is provided in the README.md file. There are several options available when executing PyQSO from the command-line. If the file does not already exist, PyQSO will create it. All debugging-related messages are written to a file called pyqso.debug, located in the current working directory. A PyQSO-based logbook is essentially an SQL database. To create a new database/logbook file, click Create a New Logbook... in the Logbook menu, choose the directory where you want the file to be saved, and enter the file’s name (e.g. my_new_logbook.db). The new logbook will then be opened automatically. If you would like to open an existing logbook file, click Open an Existing Logbook... in the Logbook menu. Note that logbook files usually have a .db file extension. Once the logbook has been opened, its name will appear in the status bar. All logs in the logbook will be opened automatically, and the interface will look something like the one shown in figure:logbook. 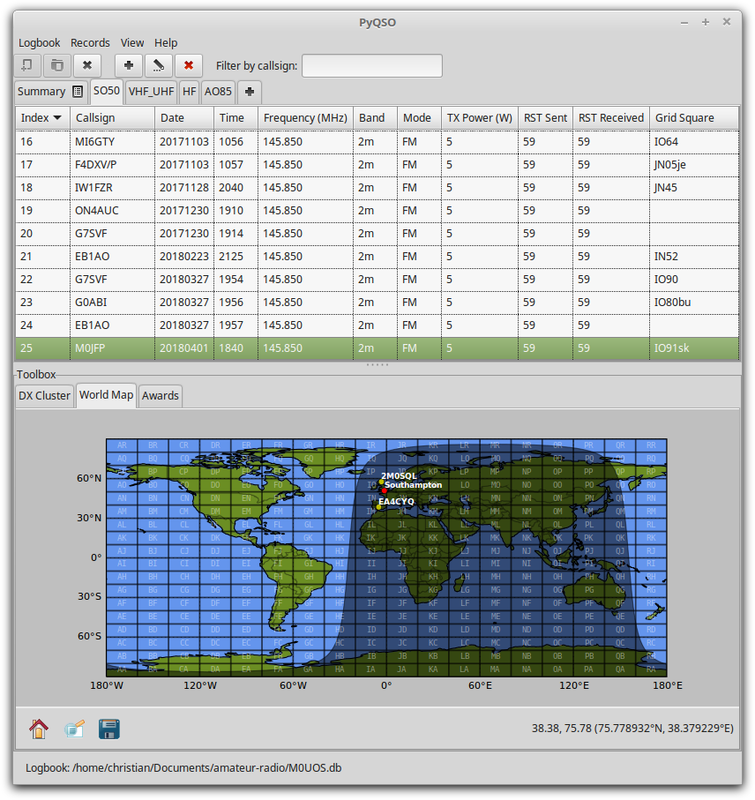 The PyQSO main window, showing the records in a log called SO50 (for contacts via the amateur radio satellite SO-50), and the World Map tool in the toolbox below it. A logbook can be closed by clicking the Close Logbook button in the toolbar, or by clicking Close Logbook in the Logbook menu. © Copyright 2015-2018, Christian Thomas Jacobs. Revision 71624162.